JYLBERT - Guyenne - Gascogne. Title : Guyenne - Gascogne.. Size : 9.5 x 13.6 inches. / 24.2 x 34.5 cm. Colouring : Printed colours with pochoir. 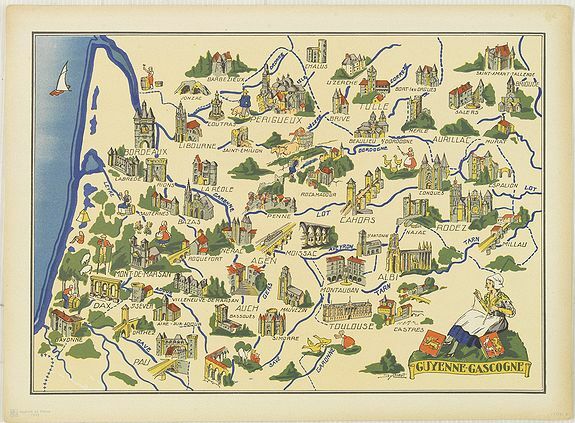 Description :Very decorative, informative map of Guyenne and Gascogne region in France. The map is filled with buildings, animals, figures and two locals. With a large compass rose in upper right corner. In lower left corner "Imprimé en France" with a monogram of the publisher "BD". The map carries a printed signature of the French illustrator who is only know by his pseudonym "Jylbert". Decorative and unusually vivid for an item published during the second world war. Condition : Colour lithography with pochoir (stencil) print in vivid colours.